The mother of all quiches…. 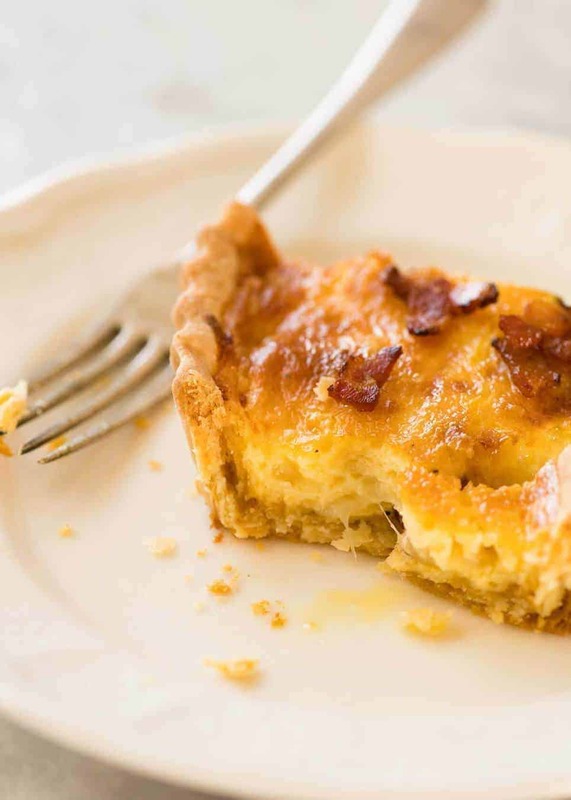 A homemade Quiche Lorraine is one of those things reserved for special occasions that puts store bought to shame. 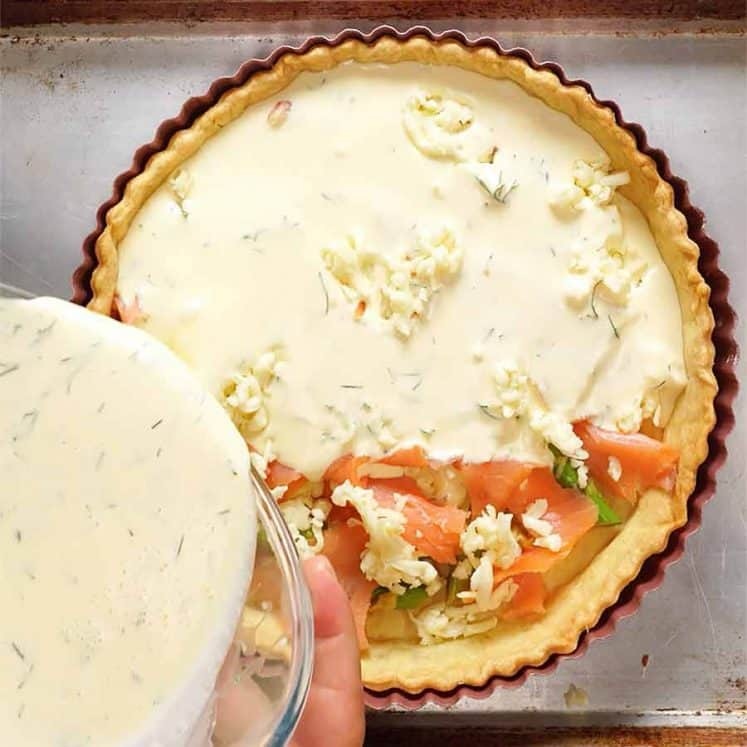 Surprise yourself with how easy it is to make a homemade quiche crust – or make life easy using frozen pastry or a pre prepared pie crust. I can’t remember when I made my first quiche, but I can tell you for sure that it was a Quiche Lorraine. 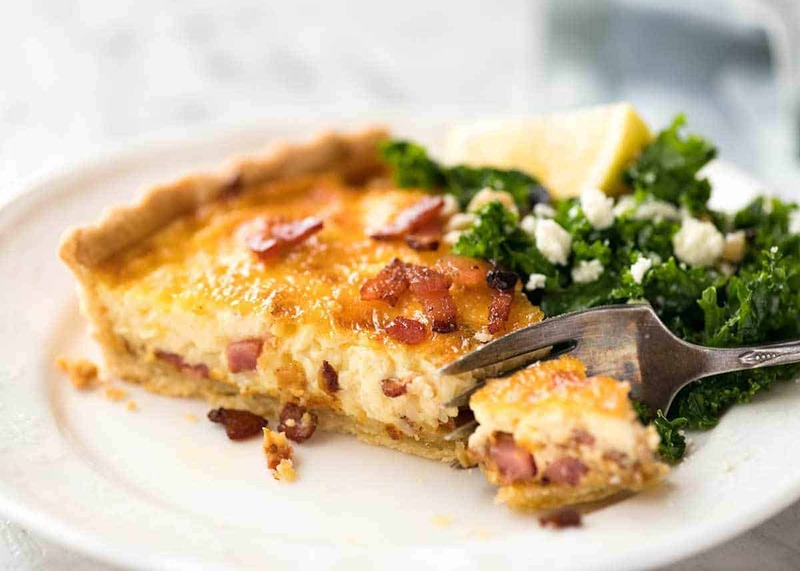 Because just as Pork Carnitas are the King of Taco Carts, Quiche Lorraine is surely the Queen of all savoury tarts. So basically, I break the rules and the French may be cursing me. But this is the Quiche Lorraine flavour that will be familiar to those who live outside of France, that I have always known and loved. The onion adds more savoury flavour. I can’t help adding garlic to that – because when I sauté onion in butter, I add garlic like I’m on auto pilot. 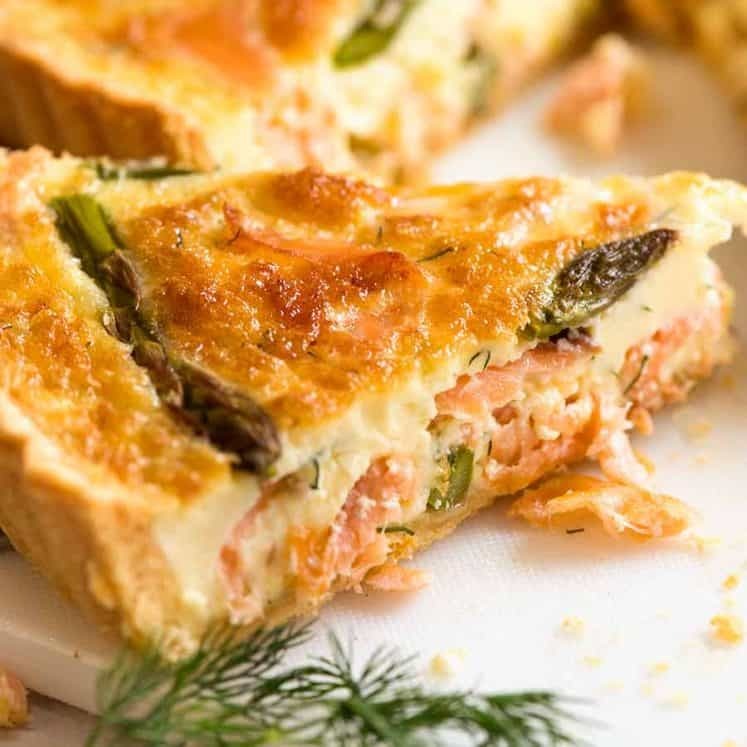 As for adding cheese… I truly cannot image quiche without cheese. I have never had quiche without cheese! 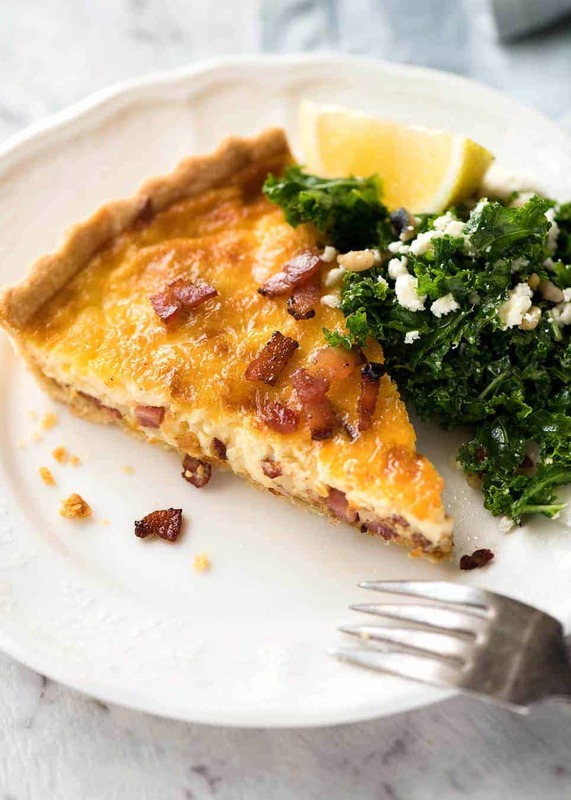 The pastry for quiche is a simple shortcrust pastry that is buttery and crumbly, crispy yet soft enough to cut your fork through without the needing to jack hammer it. 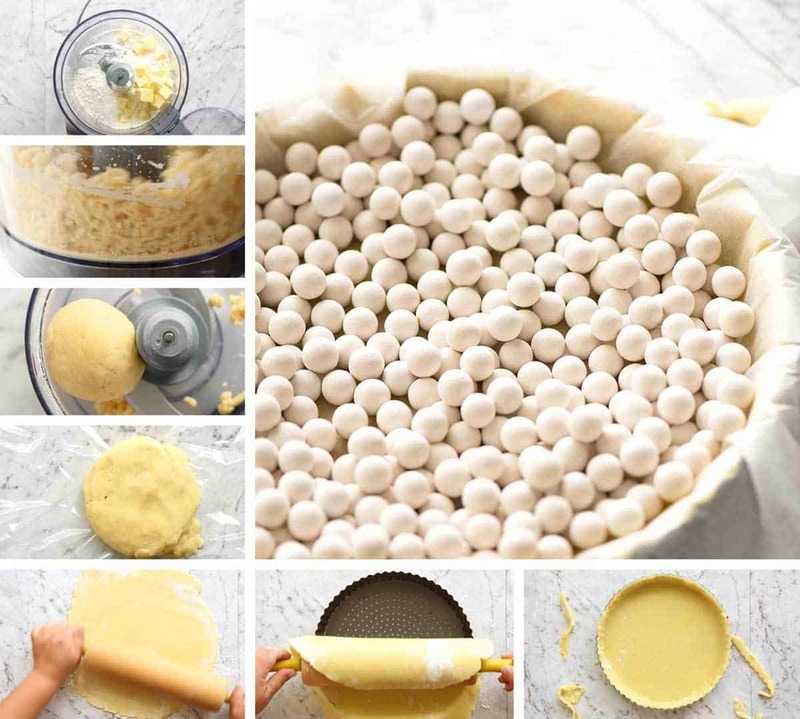 If you are lacking in time, use a pre-prepared pie crust or frozen shortcrust pastry. But if you do have the time, it is truly worth making the effort to make your own pastry. Homemade quiche pastry is buttery and flaky in a way that store bought never will be. And the thing is – it’s so darn easy using a food processor. The dough comes together in mere minutes – flour, butter, salt, water, blitz = ball of soft dough ready for baking. 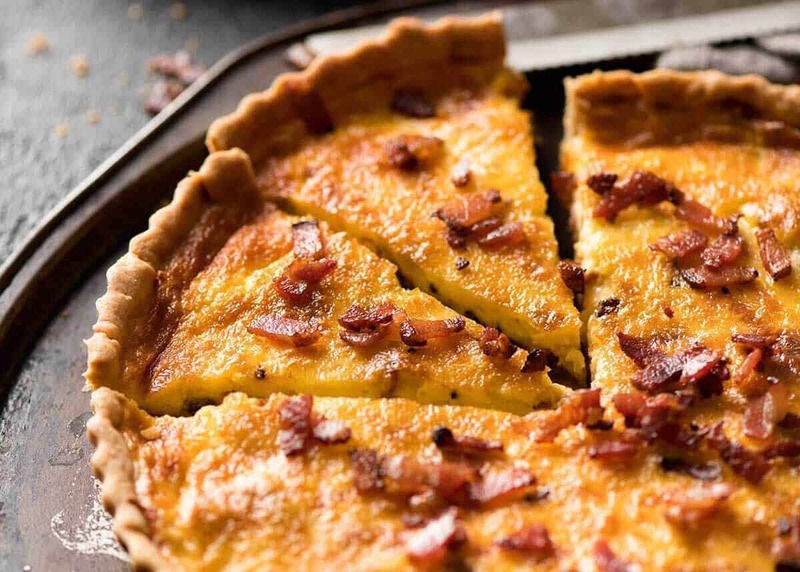 Get the recipe for a easy homemade Quiche Crust. It’s really hard to capture how buttery and flaky the homemade shortcrust pastry is in a photo, but here’s my attempt. 🙂 The pastry is crispy yet soft enough for the fork to cut through with barely any effort. Just as shortcrust pastry should be! So here is my Quiche Lorraine recipe. There have been minor improvements since I first published it, streamlining the steps and explaining them more clearly. 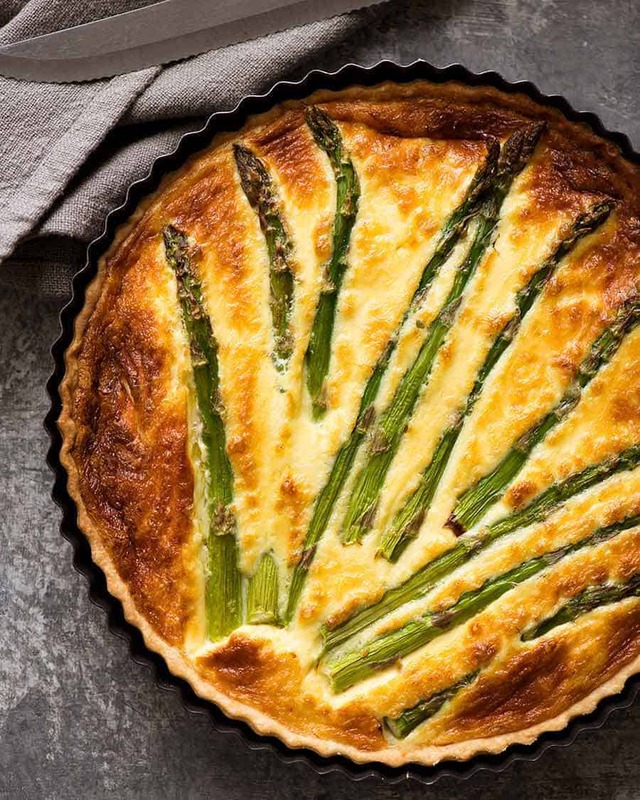 Most notably, the addition of a recipe video which I hope shows how simply the homemade quiche crust is to make, and how beautifully custardy the filling is! Kale and Quinoa Salad – pictured below, keeps well for days and days! Recipe VIDEO above. 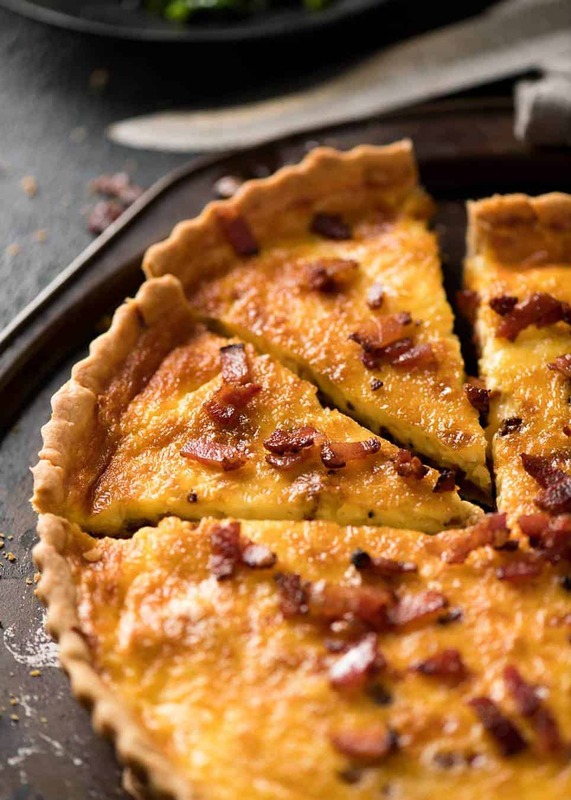 A classic Quiche Lorraine with a gorgeous smooth filling loaded with bacon. Make this with my EASY shortcrust quiche pastry or use store bought. Quiche is a brilliant make ahead because it's one of those things that truly reheats well without compromise - see notes. 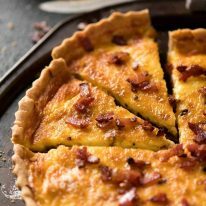 Frozen shortcrust pastry or homemade quiche crust - prepare and bake the crust per Quiche Crust recipe (23cm / 9" quiche tin). Prepared pie shell - bake per packet directions. Melt butter in a skillet over medium high heat. Add onion, garlic and bacon. Cook until bacon is light golden. Transfer to a paper towel lined bowl and leave to cool. Place ingredients in a bowl and whisk to combine. Place quiche tin with cooked quiche crust on tray. Scatter cooled Bacon Filling evenly across base of cooked quiche crust. Scatter cheese evenly across top. Carefully pour Egg mixture over the top. Push some of the cheese/bacon below the surface. Bake for 35 - 40 minutes until the top is golden. The centre should still jiggly. Garnish with Extra Bacon, if using. Rest for 10 minutes before removing from the pan to cut and serve. 1. Cream - Works really great with any full fat cream. Please don't use low fat / fat reduced cream because you will risk the filling not setting. I like to use heavy / thickened cream (for whipping or pouring) with 35%+ fat content. 2. Pictured in post with this Kale and Quinoa Salad which I happened to have on hand because it's one of the few salads I know that keeps well for days and days. 3. 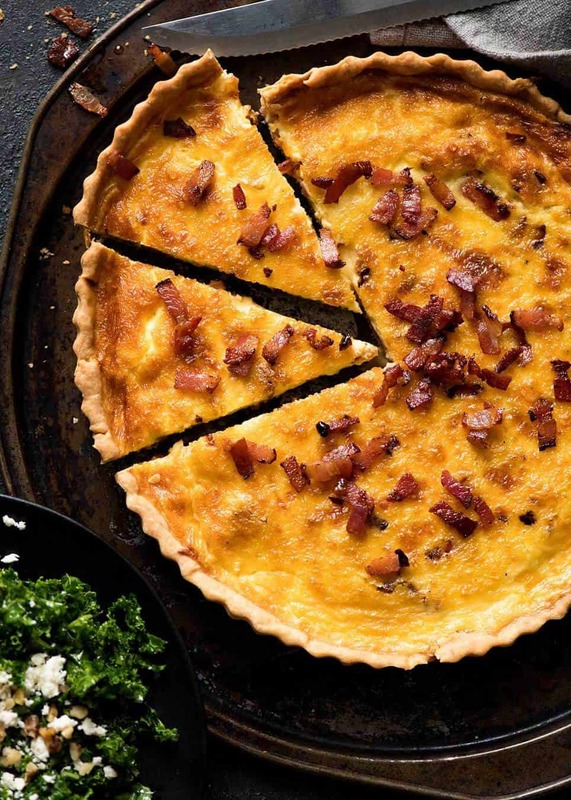 MAKE AHEAD: Quiche is brilliant reheated. Keep for 3 - 4 days in the fridge then reheat for 15 minutes at 180C/350F in the oven. Or freeze, then defrost a slice for 2 minutes on high in the microwave then bake for 8 minutes. 4. Nutrition per slice, assuming 8 slices with homemade pastry. 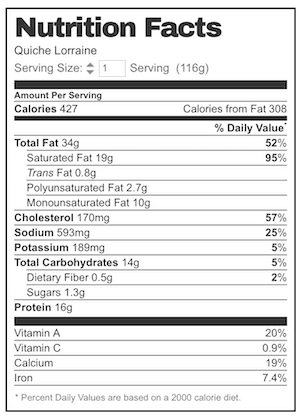 This does not take into account the drained bacon fat so the calories and fat are slightly higher than they actually are. Originally published August 2016, updated with new photos, slightly better filling and most importantly, a recipe video! Giving me those “pity” eyes….no Quiche for Dozer! 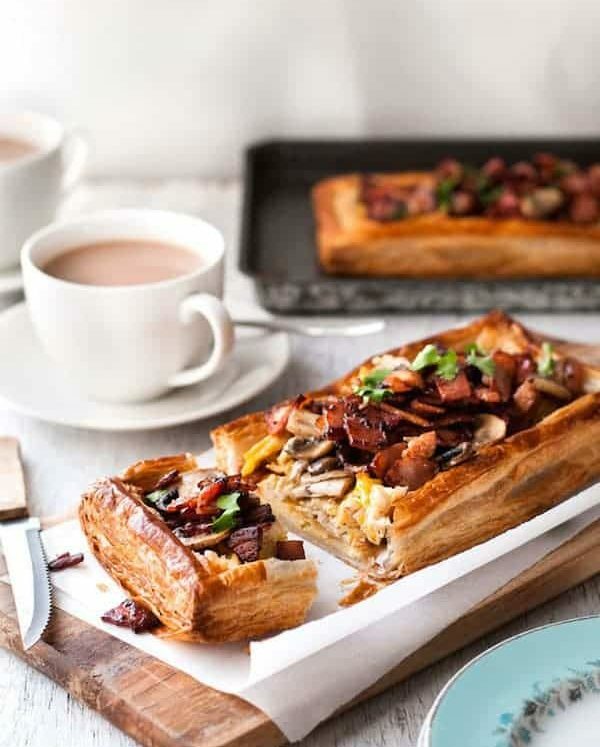 I’ve made the quiche and pastry once and it was delicious. I’m now making the crust to use with a different recipe. Both times I’ve made it I’ve had to add extra water and pulse for about 40 seconds. I see you’ve said it works with US (Canada uses the same so maybe it should say North American😉) or metric measures. That would be 60 ml vs 37.5 of water which is a significant difference. Maybe putting it in mls would help even if it mixes Imperial and metric? Love your recipes! Oops that should have said 50 ml vs 37.5. This is a wonderful receipe. It is the first yummy quiche I have ever made – I had all but given up and this was my last attempt. It is super yummy and easy. Am going to try Choc crema pie next…a fav dessert of mine. Thank you for sharing your receipes and taking the time to teach. Made this and it is the BEST! Love everything you do, you are the Awesome at what you do. 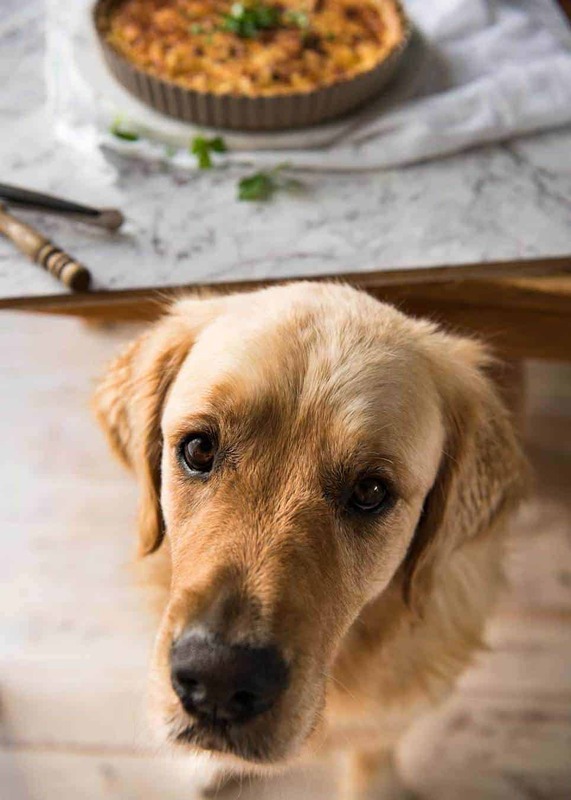 Thank you for helping so many of us find our cooking side. I was going to try this recipe, but i was wondering if i could add asparagus to it?